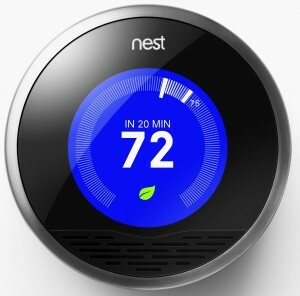 I wanted to take some time to write about one of my favorite new inventions– the Nest Learning Thermostat. I bought my first home in Dec 1012, and immediately bought a Nest Learning Thermostat. The concept came from one of the developers on Apple’s iPod team, and completely revolutionizes the thermostat. Installation was a snap. I had a few questions and was able to immediately get through to a very helpful support staff. The website documentation was above average for most technology products as well. My only real issue had to do with my previous thermostat, which had been wired incorrectly when the AC was installed. The system connected to my WPA2 network quickly and easily, and the navigation during setup was very well designed. I work in IT, so if there’s an issue in the morning, I’ll work from home to fix it before going in. I also go in late the days after a major code release/update when I have to stay up at night to check on it. Working for an airline, I travel a lot. Sometimes I forget to set the thermostat off, resulting in 3-4 days of unnecessary heating and cooling. Days when I come home early, I can use the iPhone/Android app to turn the temperature down before I get home. Just last week, I left the house and forgot to close the door to the garage. The door was left open for two days, exposing the inside to hot garage air. Due to the auto away feature of Nest, this didn’t effect the utility usage. If you haven’t had a chance to try the Nest, I highly recommend visiting your nearest Lowes, or going online to their website!